Retro style mosaic floor tile choices — suitable for midcentury bathroom floors – easily available from major manufacturers – continue to grow. Prowling around this weekend, I spotted these two new options from Daltile: They are part of the Folio One collection and are another take on a pinwheel mosaic. Next: I’m researching hexagonal tiles suitable for a 50s 60s bathroom floor. Jen: I am started to capture all Cleaning questions on the Fast & Easy Answers section – on the nav bar at the top and the sidebar just to the right of the main post. 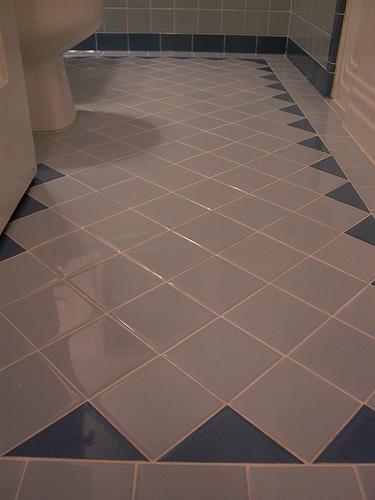 There are two posts on cleaning tile – including one on grout. Let me know if that is what you are looking for. Please also know – I will be working in the new year to make it easier to find all the resources/answers captured in the past year. The site is getting so big, even I am having trouble finding things! So improving this aspect of navigation will be a top objective.